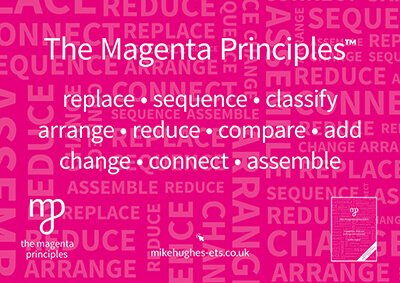 The Magenta Principles™ is a trademark of Magenta Principles Limited. For full course details and to book please contact us. Further dates and venues for 2018-19 Magenta Principles workshops will be announced here as soon as they have been confirmed. “Following our inset day looking at The Magenta Principles™, I have noticed an immediate impact. There was an overwhelming feeling that the ideas made sense and because of which they were achievable for all teachers regardless of their subject area or experience. Although I conceived and developed what I now refer to as The Magenta Principles™ over 20 years ago they still underpin my approach both when working as a teacher in the classroom and as a trainer in CPD sessions. Many people speculate where the phrase comes from and what it means – that is my secret and will remain so! Some of the core ideas of the approach were first published as far back as 1997 in Lessons are for Learning – although at that time I was only using the term Magenta Principles™ in private. The phrase Magenta Principles™ was first used publicly in 2006 when it appeared in my latest book, And the Main Thing is… Learning. 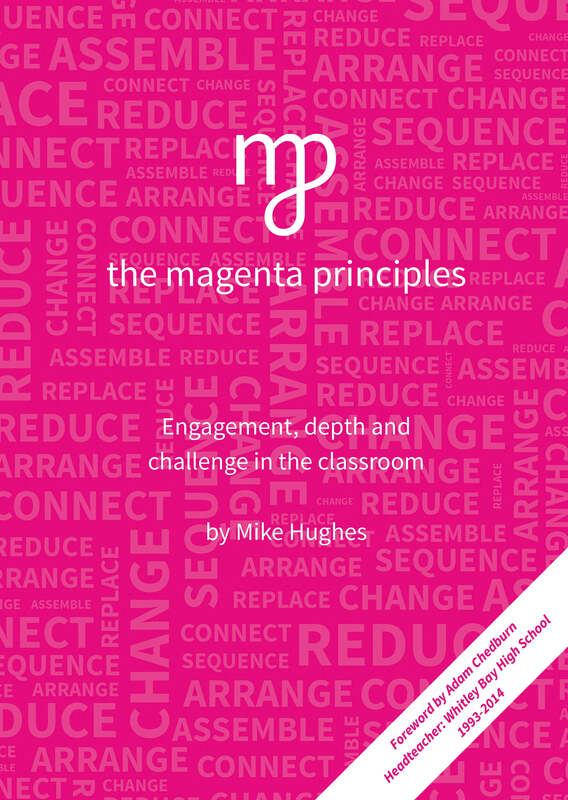 Since then, literally thousands of teachers have attended my Magenta Principles™ workshops and the phrase is now heard on a daily basis in a great many schools. Whitley Bay High School is the school that has taken the Magenta Principles to heart more than any other and have been using the approach as a framework to develop classroom practice for almost 10 years. In their own words: “If our goal was to make learning an engaging, student centred experience then the Magenta Principles was the vehicle that enabled us to get there”. Ofsted judged the school to be outstanding in both 2010 and 2013 and described teaching as, exciting and innovative. In response to a great many requests, I have finally decided to pull all of the Magenta Principles™ ideas together in one publication and my new book – The Magenta Principles™ – is now available to order. We talk about The Magenta Principles™ – but in reality there is just one principle; in order to make sense of the information that comes their way, children have to do something to/with it. Receiving it, retaining it and eventually regurgitating it is insufficient – in short they have to think about it! The receive, retain and regurgitate approach may get a child through an examination hoop but it will not develop a deep understanding and while all teachers want to help children pass exams some of us want much more – we want them to get it, get why they got it and, as much as anything, enjoy it. 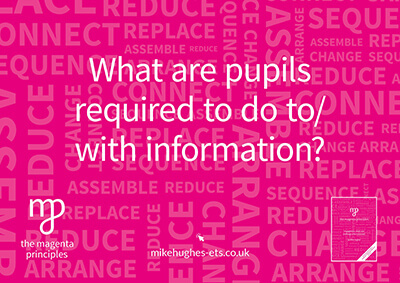 Mike’s work is hugely varied and tailored to fit the needs of the individual school/teacher. Anyone considering working with Mike is invited to contact him to discuss their requirements and explore possibilities. Please include the name of your school in your enquiry. By ticking this box, I agree to allow Mike Hughes ETS to contact me regarding my enquiry only, using the information I have input into this form.